In the morning, a couple hundred employees crowded into a room in our student commons to hear our president explain significant cuts and restructuring in academic programs and co-curricular/administrative staffing, necessary to avoid the multi-million dollar deficits projected for the next two fiscal years. In the evening, 1,500 people crowded into Benson Great Hall for a free lecture by New York Times columnist, NPR/PBS commentator, and bestselling author David Brooks, who came in part to praise Christian colleges like Bethel as “thick” communities that take spiritual and character formation seriously. In a span of less than twelve hours, we experienced Bethel at its best: an educational institution that forms the hearts and souls, not just minds, of students and hosts important, irenic conversations about faith, meaning, community, service, and virtue… and Bethel at its worst: seemingly always on the verge of fiscal crises that put what’s best about us in chronic jeopardy. 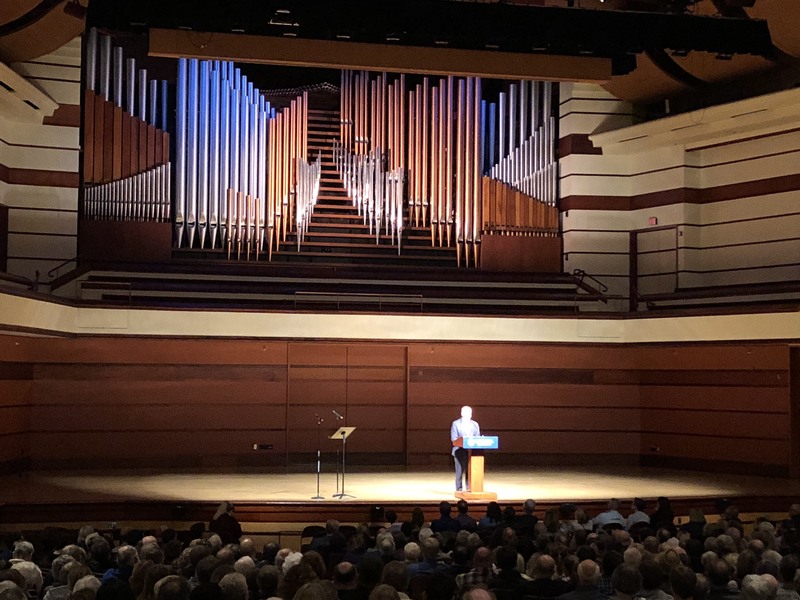 I’m thrilled that 1,500 people came to @BethelU on a Tuesday night to hear an erudite, funny, insightful lecture about love, hope, yearning, wisdom, literature, politics, and community. But here’s the thing: that happens every day in classrooms here. Every day. Brooks quotes Nietzsche: “He who has a why to live can bear almost any how.” It’s a remarkable thing to hear today at a Christian liberal arts college. Because if anyone should have a “why” to bear the current “how,” it’s us. But do we? I goofed: the Nietzsche line is actually, “He who has a why to live for can bear almost any how.” Brooks recycled it from Road to Character, where it appears in a passage on suffering that features Holocaust survivor Viktor Frankl. …any attempt to restore a man’s inner strength in the camp had first to succeed in showing him some future goal. Nietzsche’s words, “He who has a why to live for can bear with almost any how,” could be the guiding motto for all psychotherapeutic and psychohygienic efforts regarding prisoners. Whenever there was an opportunity for it, one had to give them a why—an aim—for their lives, in order to strengthen them to bear the terrible how of their existence. Woe to him who saw no more sense in his life, no aim, no purpose, and therefore no point in carrying on. He was soon lost. Indeed, it’s the quest of “faith seeking understanding” that often brings people without faith into our lives. As I hinted in my tweet, it might seem odd that someone as anti-religious as Nietzsche was being quoted at all in last night’s setting — much less from a work in which he castigated Christianity as one of Europe’s “two great narcotics” (alcohol being the other). But it’s precisely because our why at Bethel is to seek after truth and wisdom, justice and peace, that our how includes listening not only to Christian figures like Dorothy Day and St. Augustine (both quoted by Brooks in his conclusion, and both part of our reading packet this year for Bethel’s foundational Christianity and Western Culture course) but critics like Nietzsche (who has also featured in CWC). So yes, our why at Bethel helps us to bear a how that takes away the jobs and potentially careers of some of us and likely requires more work for less compensation from those who remain. In those teaching, researching, and writing moments when I experience the why most vividly, I can temporarily forget that this present how required me to spend hours this summer working with five other professors and one dean to make recommendations for which programs should be cut. But a hopeful why can also tempt us to move too quickly past a cruel how. The death of programs and positions — perhaps the dying of our ethos, ideals, and vision for Bethel — is not freely chosen and does not come at anything close to the right time. We should indeed look back and celebrate what’s been achieved, but that “estimate” can’t offset the loss of what’s been, what is, and what can no longer be. And those of us who remain are bound to notice Nietzsche’s “almost any” and wonder if the how could someday become unbearable — or worse, cause us to revise the why. I hope this doesn’t sound too dire. I love my work and the people with whom I do it: colleagues, students, alumni, even bosses. And I don’t mean to say much more in this space about our current situation. Instead, I feel like my most immediate why is to listen to my sisters and brothers in Christ describe their current how and to offer whatever consolation I can.